On Wednesday, September 12th we’re firing up the ole BBQ-PIT buried in the Carpe Vino garden for the fourth installment of our “Open-Pit” series. Hundreds, if not thousands, of people perusing the streets of Old Town that day will be overwhelmed by the mouth-watering nuances coming from our wood-fired, open-pit bbq as it slowly cooks a Sinclair Family Farm 90 POUND HOG to pure deliciousness. 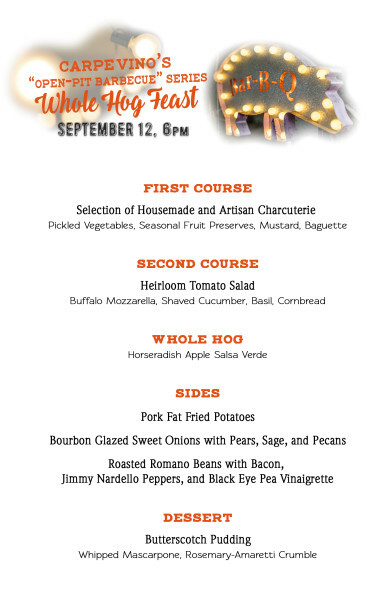 RESERVE your tickets now for this Italian inspired-meets American South masterpiece of a menu. Staying local, we are sourcing this naturally grown, pasture raised hog from “Sinclair Family Farm” located in Penryn. A predator friendly farm (use guardian dogs), Sinclair has been operating over 20+ years raising lamb, goat, pork, chicken, rabbit and cattle for our community. Being pasture raised allows these animals to grow at their natural pace while grazing on their natural diets. Though not certified organic, Sinclair livestock & chickens are not subject to antibiotics or hormones.